I love apple cobbler! Maybe it’s because I love apples, but it doesn’t really matter why. All that matters is that I love it, and have to make it every fall. I’ve even served it at Thanksgiving a few times! 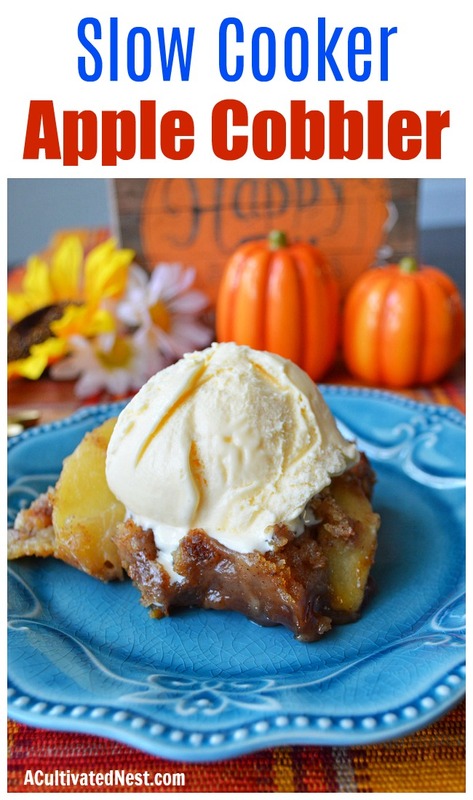 Which is what has led me to discover that apple cobbler can be just as delicious baked in your slow cooker as baked in the oven. And if you’re trying to put Thanksgiving dinner together at the same time, it’s a big time saver! 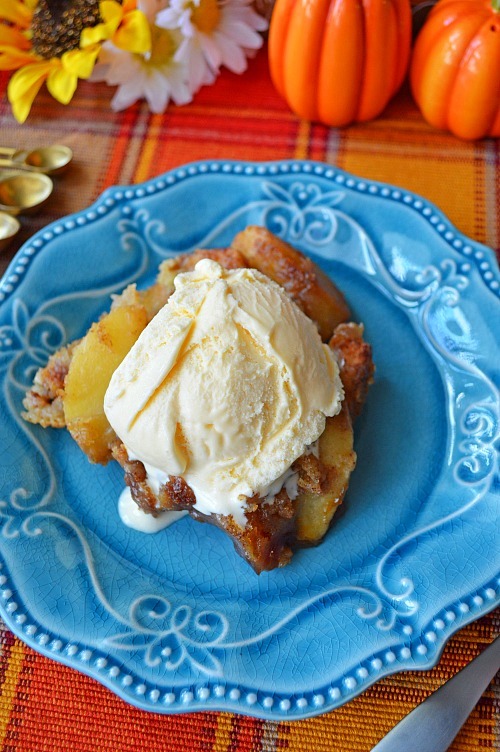 Here is how to make your own scrumptious Slow Cooker Apple Cobbler! 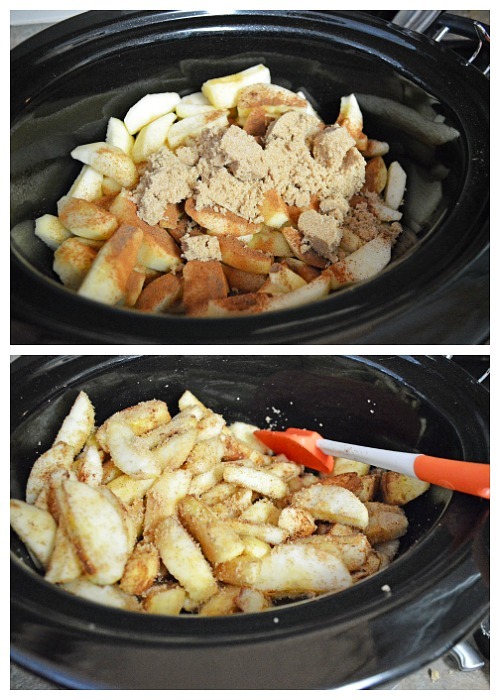 I love the ease of making an apple cobbler in my Crock-pot! It’s very handy at Thanksgiving, but you also can’t beat the ease for just a normal fall day when you want to make a sweet treat, but don’t have a lot of time. I’ve also used this recipe when I wanted to have something hot and ready for guests that were coming over, but still needed more time to clean. Slow cookers really are life savers (or at least, time savers)! 1. Spray inside of slow cooker with non-stick spray. 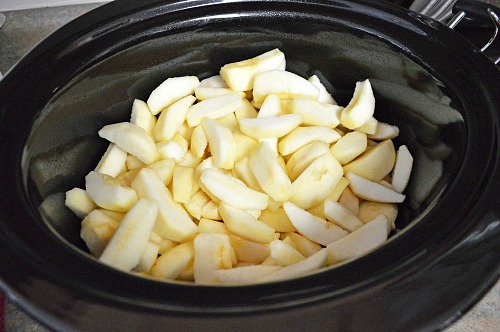 Add apples to slow cooker. 2. Add brown sugar, 1 tsp of the cinnamon, and apple pie spice. Stir to combine. 3. In a large bowl, mix together flour, sugar, baking powder, baking soda, and salt. 4. 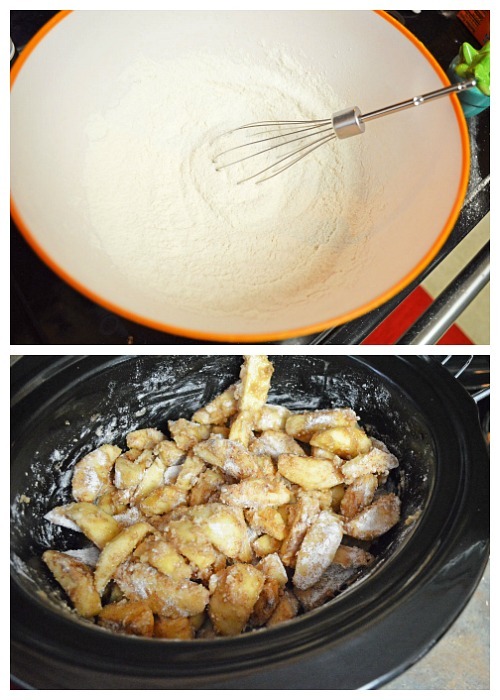 Sprinkle flour mixture over apples. Sprinkle with additional 1 tsp of cinnamon. 5. Drizzle melted butter over the flour and apples. 6. Stir ingredients inside your slow cooker to combine everything. 7. Put the lid on and cook on high 2 1/2 hours to 3 hours until apples are tender. 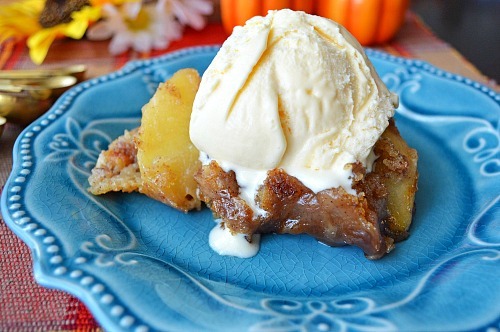 Then your slow cooker apple cobbler is ready to be enjoyed! I prefer mine warm, right after cooking, ideally with some ice cream on top (homemade ice cream makes it even better). But you can let it cool down a bit, then put it in the fridge to eat the next day. In that case, after taking it out of the fridge I think it’s best to either let it sit out a bit to get to room temperature before eating, or put it in the oven to warm up a bit before enjoying. A casserole dish covered in foil would be best for warming it up without burning it. 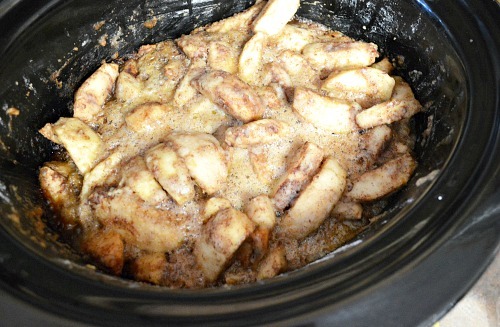 The longer you cook your slow cooker apple cobbler, the more the apples will break down. If you want your apples to be firmer, test them at about 2 hours in, then test in 15 minute increments from there until they’re at the texture you prefer. Also, depending on the age/make/size of your slow cooker, your homemade apple cobbler may be done in only 2.5 hours, or it may take a bit longer than 3 hours. If you know your machine tends to run hot/cold, adjust your cook time accordingly. Some people also like to add pecans to their apple cobbler! If you want to add them to yours, mix them in on step 3. 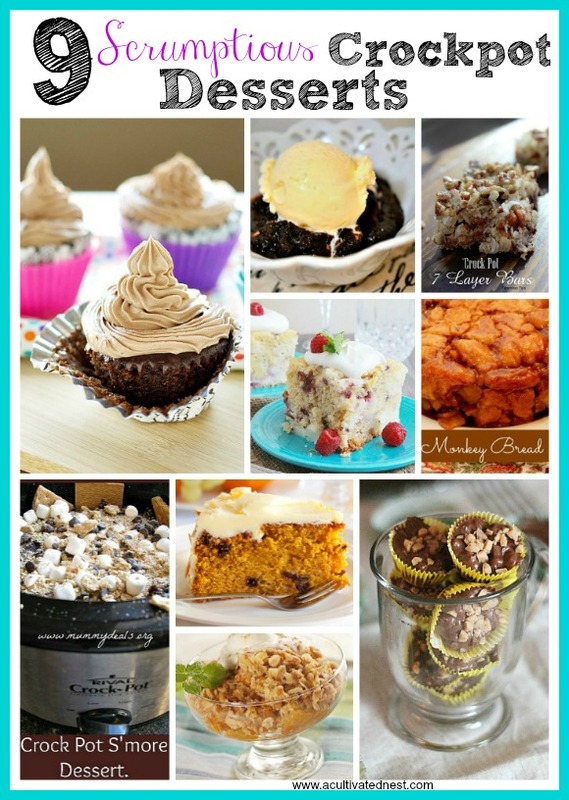 Do you often bake in your slow cooker? 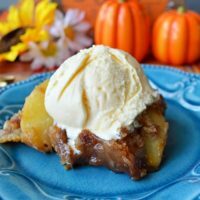 This slow cooker apple cobbler recipe will help you easily make a delicious dessert, even on your busiest days! This is perfect for fall! Spray inside of slow cooker with non-stick spray. Add apples to slow cooker. Add brown sugar, 1 tsp of the cinnamon, and apple pie spice. Stir to combine. Sprinkle flour mixture over apples. Sprinkle with additional 1 tsp of cinnamon. Drizzle melted butter over the flour and apples. Put the lid on and cook on high 2 1/2 hours to 3 hours until apples are tender. Depending on the age/make/size of your slow cooker, your homemade apple cobbler may be done in only 2.5 hours, or it may take a bit longer than 3 hours. If you know your machine tends to run hot/cold, adjust your cook time accordingly.